Στην περιοχή Κο Τοκ, το Reef On The Beach by The Reef Resort αποτελεί ιδανικό σημείο για να εξερευνήσετε την πόλη Κοχ Ρονγκ και τα περίχωρα. Το κέντρο της πόλης είναι μόνο μακριά και μπορείτε να φτάσετε στο αεροδρόμιο μέσα σε λεπτά. Από τη βολική της τοποθεσία, η ιδιοκτησία προσφέρει εύκολη πρόσβαση σε κορυφαίους προορισμούς της πόλης. Οι εγκαταστάσεις και οι υπηρεσίες που παρέχει το Reef On The Beach by The Reef Resort διασφαλίζουν την ευχάριστη διαμονή των πελατών. Κορυφαία χαρακτηριστικά του ξενοδοχείου συμπεριλαμβάνουν τα 24ωρη φύλαξη, υπηρεσία ταξί, υπηρεσία εισιτηρίου, φύλαξη αποσκευών, εστιατόριο. Το ξενοδοχείο διαθέτει 19 όμορφα διακοσμημένα δωμάτια, πολλά από τα οποία περιλαμβάνουν κρεμάστρα ρούχων, λευκά είδη, καθρέφτης, πετσέτες, ντουλάπα. Το ξενοδοχείο προσφέρει μερικές μοναδικές ευκαιρίες ψυχαγώγησης όπως οι κανό, καταδύσεις, ψάρεμα, μασάζ, κήπος. Το Reef On The Beach by The Reef Resort είναι ένας ιδανικός τόπος για να μείνετε αν ψάχνετε για γοητεία, άνεση και ευκολία στη Κοχ Ρονγκ. This is really a nice place to stay! There is a white sand beach and turquoise water. You can hear the sea at night. I really enjoyed my stay, it is the perfect Place to relax and just do nothing. The owners are very friendly and want you to feel comfortable. The food is ok, but there are not so many veggie options, which is no problem at all because you can walk along the beach and try the different restaurants around. It is well cleaned, but there is no room service which I didn't need. There is a boatshuttle, to the village tree times a day, if you like to do some shopping or just see another place. They offer some activities every day, which I didn't try because I just felt like doing nothing and enjoy. Best place to stay at Koh Rong! The hotel is located at the best beach of the island. The bungalows are super comfortable and spacious. The restaurant has delicious food and the hotel offers a variety of fun activities! If you are planning on visiting this Island this is the place to stay! This place is located on a beautiful beach. The bungalows were big and for khmer situations quite comfy. The staff is like a group of students. No organization, food menu is the worst.food itself was the same. No charme or athmosphere over there. For a short stay ok. If they would be more organized and have educated waiter staff it could be a awesome place. Not recommendable under these circumstances. Nice Beach. Bungalows were clean. Boattaxi to the mainvillage nesessery because 2 Brigdes were broken. Would be awsome if they would be fixed. Stayed for one night, asked for 1 double bed got two doubles and a single. The new manager is very friendly and helpful Nice beds, mosquito nets on all of them Cons: Complimentary boat was not free, still a good service tho $2per person! Beautiful quiet beach with Bungalows (ocean view ones) on the beach. Basic amenities but you are away from it all. It does have your own bathroom and mosquito nets. The Aussie owner is very friendly and helpful along with the other staff. The food is a mix of Asian and Western. The only issue was the Bed was very hard but other than that the place to s wonderful if you want squeaky white sand, turquoise water and hardly any people. So, I LOVE reef on the beach. Initially booked one night.. stayed 3 then left to explore other areas. Ended up staying for another couple of nights after that as well. The guys running the shuttle boat to and from the main village are LEGENDS. So fun, ended up having beers and singing karaoke with them. The staff on the resort are also super friendly and helpful. The beach is beautiful and so so peaceful.. perfect if you need a getaway! Also, the bioluminescent plankton was just as good on the shore of this beach as it was in the middle of the sea! There is a place next door with wifi so the no wifi thing wasn't an issue for us. facilities? only a mediocre cafe, even no coffee ( well can't call it coffee) The room was fine, good. Good size room and sufficient bathroom. Vast Majority of "resorts" on Koh Rong Do Not have air conditioner. Was not a problem for us (we mid Feburary) as the breeze from ocean, with the fan, was plenty. The best feature on this 'hotel' is the location; IF you're looking for peace and quiet. It is a 35-40 minuter walk from the ferry pier. If you're looking for noise, unknown company,and head banger computer repitious "music", stay close to the pier. Facilities? The huge web travel sites have not extolled the virtues of this island,,,so far. Go now, as "progress" is not far away. Pros. Location Cons. Mattress in beach bungalow are actually Box springs. Not a mattress. Garden view #3 we could see wood savings and Hear the termites. Bathroom sink drained directly onto the floor. End of the day you are on an island in Cambodia. I don't expect luxury, but I do expect a mattress. EAt at the little restaurant towRds town. Best authentic food. All the hotel staff eat there. Definitely recommended! The location is amazing; 10 steps out the door and your on 4K beach - perfect for relaxation and enjoying nature's wonders. The staff are super friendly and helpful. Was able to reach them by email and facebook, where they responded in minutes! Best communication from a resort I've ever seen - that has been tremendously supportive to the planning of this vacation. Cheers. The location is not convenient and only two restaurants nearby. We went there 9am and nobody turned up to pick us up. We've been told to wait 11am and 12:30 be picked up and nobody again.eventually boat company helped us to drop us off the hotel about 1:40pm. Hotel told us they drive boat to village twice, but they went back even they didn't get customer. When I came back to village, I saw they have a small sign next to diving center, so make sure you can find the sign if you book it, otherwise nobody come to find you and wait you with your name. Newly built bungalows, no frills but just what you need. Spacious, good fan and nice porch. The location is the main catch...teal water, no people...perfect. Only con is limited food options close by but that didn't affect our stay it was awesome! Stay here to get away from the main beach/parties. Even though there is a regular connection (via boat & for free) from the hotel to the pier and back, our pickup didn't work out for three hours due to the fact that the staff didn't give us any information during our first three phone calls. When we finally arrived, the views were amazing though and the truly beautiful beach made us happy again. The bungalows on the other hand were very very basic. They look way older than just 6 months. The bathroom provides zero privacy and zero luxury, there are geckos, cockroaches and all kinds of flies/bugs in the bungalows. The two restaurants (one directly next to the resort, one only reachable by walking 10-15 minutes along the beach and through a river) are both good and affordable. 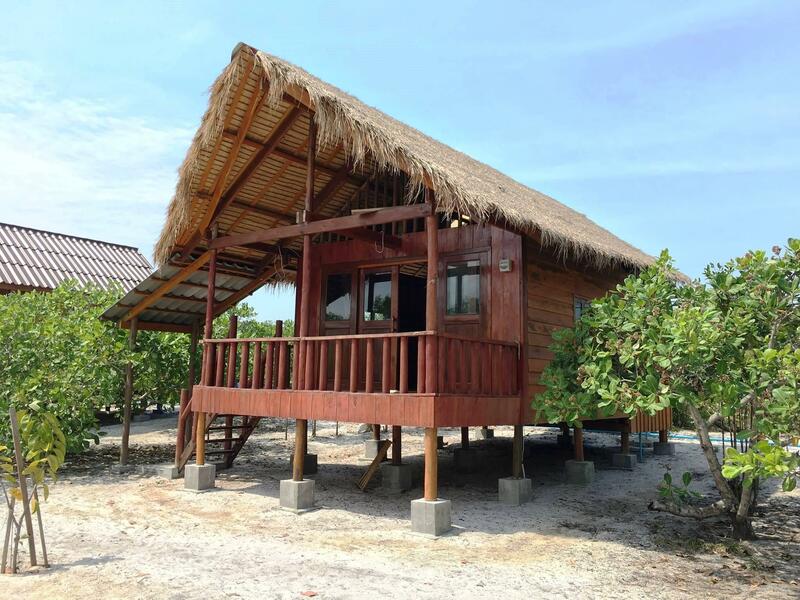 All in all: wonderful location, fair budget snorkeling tour, ideal for budget travelers (paid $18/night in the sea view bungalow during low season). Calm, quiet, white sand beach; this is a great place for relaxing. We stayed in the beachfront bungalow, which was sturdy, had a great balcony, ensuite bathroom and power 24/7. Due to being right on the beach and the humid climate things can get a bit damp and musty in the towels and linen. The towels were pretty gross, but we just used them for the beach. Buy coconut oil, we got bitten to shreds by the sandflies without realising. There is a free taxi boat, to and from the main port, that is scheduled to run 4 times a day (when we were there). So you can catch it when you arrive - pick up should be around Cocos Bar, just ask the staff there if you're stuck. Reef on the beach lies on Long Set Beach which is a long,very beautiful and calm beach with only another Resort and two restaurants. In rainy season the connetion to the main beach (Tui Beach) is a little difficult, either you have to wait for the supply boot which drives 3 times the day or you have to walk 20 minutes and cross a little river. The owner of the Resort just changed, still struggling with organisation, however he is very friendly and eager to make your stay to your best. The food is really really tasty, however a little expensive. Wir hatten uns diese Bungalows ausgewählt, weil sie nicht direkt im Village sind und die Lage ist auch wirklich ein Traum! Anfangs waren wir total begeistert. Die Bungalows sind einfach aber zweckmäßig. Nach ein paar Tagen waren wir dann allerdings nicht mehr so ganz begeistert: Der Mülleimer wurde kein einziges mal geleert, geschweige denn mal der Boden gefegt oder ähnliches (was in sandiger Umgebung so eine Sache ist....). Auch Toilettenpapier war ein ständiges Thema... Ich glaube zusammenfassend kann man sagen, dass die Bungalows wirklich super schön gelegen sind, wenn man Ruhe sucht. Allerdings die Bungalows wirklich nur was sind, wenn man was einfaches sucht und sich nicht daran stört, dass der australische Besitzer sich halt dann manchmal doch lieber ein Bierchen mehr am Abend gönnt, als sich um die Bungalows oder seine Gäste zu kümmern... (auch wenn er grundsätzlich sehr bemüht war).